It’s always frustrating when, through no fault of your own, a bit of your studio gear is rendered obsolete. Often it’s a software or operating system update that does the damage, though there are also cases when a manufacturer simply stops offering support. We’re pleased to be able to say, then, that there’s some good news if you’re an owner of Digidesign’s ageing ProControl or Control|24 controller hardware. Thanks to Neyrinck and its V-Control Pro 2.3 software, not only are these compatible with the latest versions of Pro Tools again (11,12, 2018 and 2019) but, for the first time, they also work with the Logic Pro X, Cubase and Nuendo DAWs. For many users, both controllers were effectively bricked when Pro Tools 11 was released in 2011, thanks to the move to 64-bit. There were then vocal requests for someone to make them compatible with the universally-supported HUI protocol, and now Paul Neyrinck has answered the call. 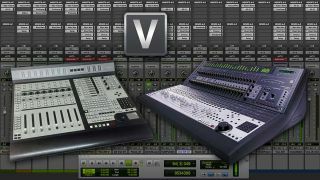 There are three versions of V-Control Pro: a free edition that can be used to test its viability; a $49.99 a year subscription; and a $199 outright purchase. Find out more on the Neyrinck website.